This 13-year old girl has a severe skin condition which causes blistering and scarring. Her right hand is permanently fisted and left hand fingers have rather limited movement. She wanted to be able to learn to play a keyboard. 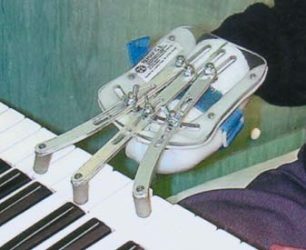 A chord playing prosthesis was made. This is able to depress three alternate keys on the keyboard. The fingers were made from aluminium with thimbles on the ends which accommodated for the height difference between the black and white keys. The client is now able to play the chords she wanted to play.